This page lists some of the most popular stock market posts, by sub-grouping. How Much Will a $10,000 Investment be Worth in: 20 Years?, 10-Years?, 5 Years? 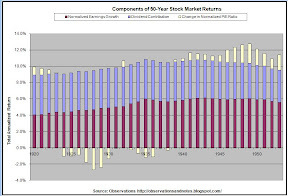 Just 2%/Year in Expenses Could Reduce Your Retirement Portfolio by 50%! Dow 25-year moving average history as long-term support level. See Full Subject Index for an index of all posts in all categories.